Dinosaurs are so incredibly fun to learn about. They are big, exciting, and mysterious! 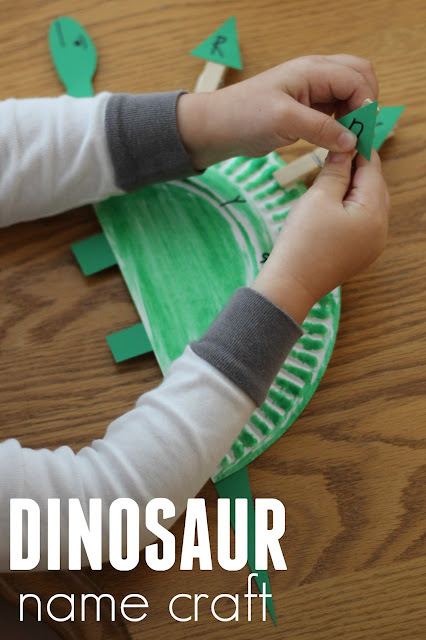 A few years ago my oldest son was obsessed with dinosaurs and volcanoes, so we made a name stegosaurus craft and did several other dinosaur themed activities. For Virtual Book Club for Kids this month we are spotlighting Goldilocks and the Three Dinosaurs by Mo Willems so we decided to do another dinosaur name craft inspired by the dinosaur theme. If you haven't read this book you must RUN and go get it. I LOVE it! This is a craft-activity since it can be used to do something... it isn't just to stare at. I love interactive crafts that embed a little learning. This craft helps kids practice matching alphabet letters. It also exposes them to the letters in their names and helps them build their name in order. To get started have your little helper paint half of a paper plate. Next cut out paper triangles for plates, a head, and a tail. After that you'll want to write the letters of your child's name on the triangle plates and stick the triangle plates onto the clothespins using double sided tape. Then you'll also want to write those same letters on the paper plate in name order. Add the dinosaur's head, tail, and legs as well!! This was a super simple project that took maybe 5 minutes, so we weren't making anything fancy or super artsy. The goal was to practice the letter matching, not have the cutest dinosaur ever. If you want to spend more time on the dinosaur you could add colors, stickers, etc. 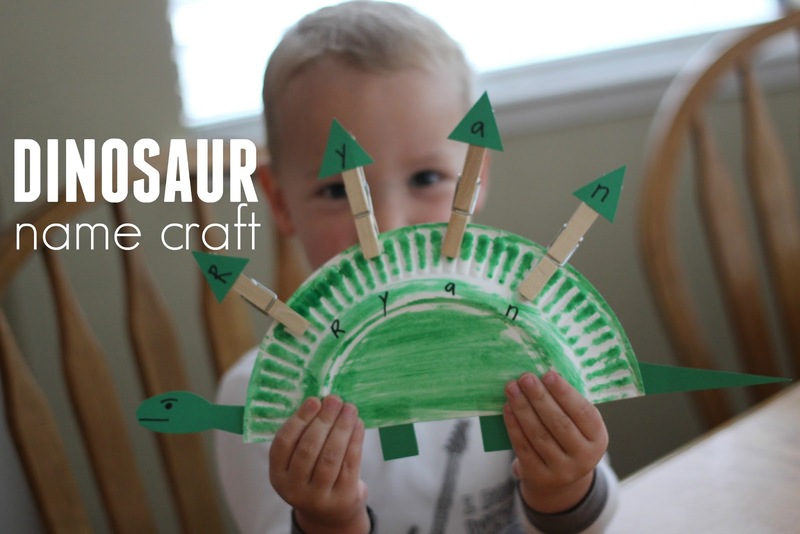 Once the dinosaur is built it is time for your child to begin matching the plates to the correct letter and build their dinosaur! My son was SO PROUD of the dinosaur he created!! He thought it was super cool that his name was on the dinosaur's back. Since this is a craft-activity you can take the clothespins off and put them on again and again. You could also make an alphabet dinosaurs with even more alphabet letters if you want! Do your kids like dinosaurs? Which type is their favorite? If you have any other favorite dinosaur activities please share them in the comments!! What a super cute activity to do after enjoying the book.